I’ve loved dragons for as long as I can remember. I think in my heart dragons are like the magical cousins of horses. Dragons are everywhere, from mythology, to Harry Potter to Game of Thrones. 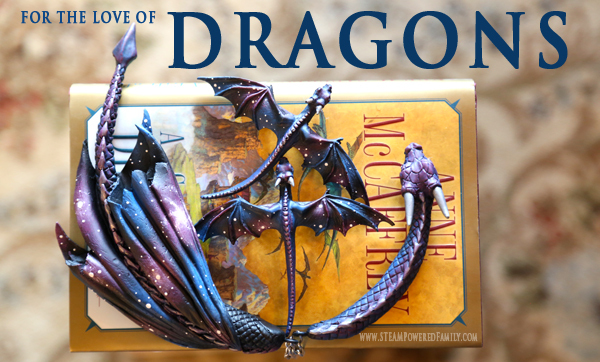 These mystical creatures are a part of our culture but one person who ignites the greatest passion for dragons, and that you may never have heard of, is Anne McCaffrey and the Dragons of Pern. Before there was Harry Potter or Hunger Games or Percy Jackson, there was Dragons of Pern, and if you have a teen who loves those books, this series will capture their hearts and passions. Anne McCaffrey is the very prolific and award winning author of the Dragons of Pern books, a science fiction series. That’s right, it’s not classified as fantasy but as science fiction. The Dragons of Pern series is the story of humans colonizing a new planet and breaking off all ties to Earth. So although there are dragons ridden by elite warriors who possess telepathic connections with their dragon partners, it’s truly a science fiction series. There are 25 books in the series plus some short story collections. 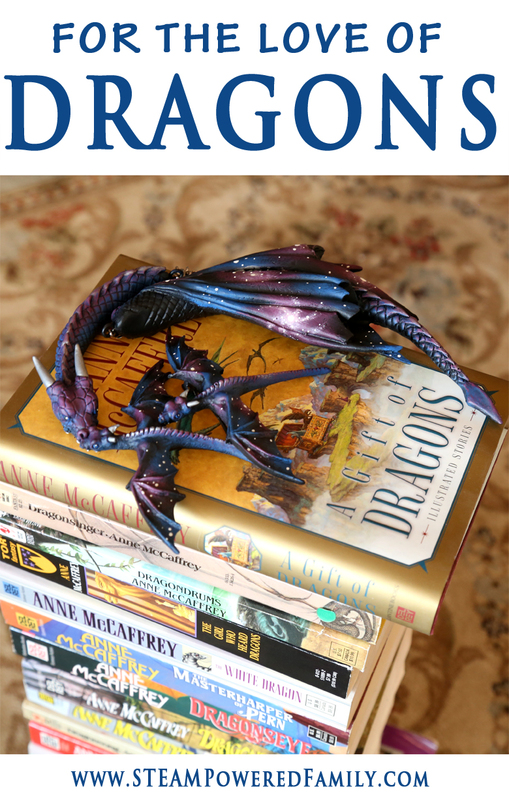 LOTS of reading for your avid reader and dragon lover. So often I will read a story and become so invested in the characters that it is slightly heartbreaking when the story is over and I wonder what has happened to my beloved fictional friends. Due to Anne McCaffrey’s prolific writing (plus her son Todd who did some co-writing with her, although I haven’t enjoyed those stories as much) in this world I can follow my friends and see them throughout their lives. It’s very fulfilling to read this series and will keep your avid reader in books for a very long time! One of the things Anne McCaffrey does very well in her stories is examining giftedness. If you have a gifted teen, the Dragons of Pern books and Anne’s other book The Rowan, are a wonderful look into the lives of people who are gifted. Even though her stories are very much set in an alternate universe, the insights Anne McCaffrey has into the lives of gifted people is profound. The series is also a great look into the dynamic of society, politics and human interactions. It could be used as a study into how societies develop, change and grow. And how technology affects society. As technology becomes such a significant force in our world, I find Anne McCaffrey’s books are only becoming more relevant. Which is astonishing considering some of these were written over forty years ago. But the best part of the series, in my opinion, is the dragons! Oh and the fire lizards. The fire lizards are native to the planet and can be impressed upon birth, becoming the most adorable and useful pets. The dragons are the larger cousins of the fire lizards upon which elite warriors ride and fight thread, an organism that falls on the planet from outer space and eats all organic material it touches, including people! It’s like acid rain times a million! The dragons are impressed immediately upon hatching to a human, creating a telepathic and soul connection that lasts until death. Oh how I dreamed as a teen of having that kind of connection with my horses! If you have a teen who is a lover of dragons and/or science fiction, this is a wonderful series to introduce them to, especially since Warner Bros has purchased the options so we may see the books on the screen at some point! If you are new to the Dragons of Pern series it might be a little confusing getting started. There are so many books, they were not written in chronological order, and many of the timelines in the stories overlap. So there really isn’t a correct order to read them in, but here are my suggestions for those new to the series. One way to be introduced to the world would be to start with the short story collection: A Gift of Dragons. This will give you a nice collection of short stories and a feel for the world and amazing characters. It also makes a wonderful gift as it is hardcover and illustrated. Another way to start would be to begin with the first three stories written in the series. Really this is where it all began and from there Anne McCaffrey moved throughout the timeline adding in stories. You can get all three stories in one massive book called The Dragonriders of Pern or you can buy them individually. I’ve been re-reading this series, the first time I’ve read the books since I was a teenager, and I think I love them even more now. I love them so much had Art by Aelia create my very own dragons and fire lizards. When I saw a picture of her dragon drapers (worn as an open fronted necklace with the dragon draped around your neck) I knew I had to have them. In the end I actually commissioned her to make me a dragon draper, a pin and a hair clip. Using TARDIS blue as one of the colours of course! Gotta bring my love of The Doctor and Dragons together! For those interested in reading the Dragons of Pern series in chronological order (not the order they were published in), here is the chronological order as best as I can sort it out with purchase links to Amazon. I divided them by the Passes, which is what they call it when Thread is coming down which is caused by the passing of the Red Planet (hence the name Pass). It only does this at certain times, so each pass is like a separate marker in history. I hope you enjoy The Dragons of Pern!